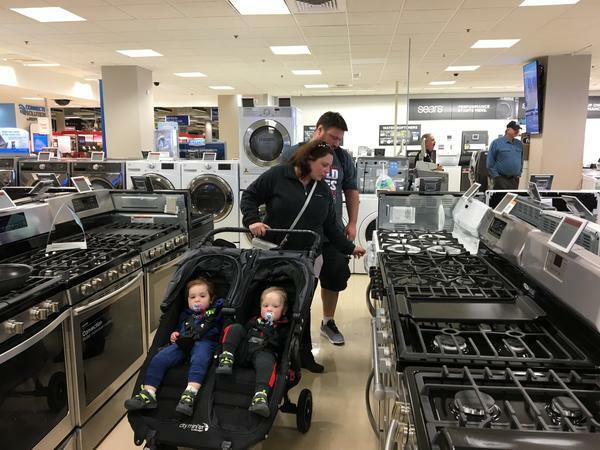 Carla and Jeremy Lang push their twin 18-month-old sons in a stroller while looking at ovens and stoves at a Sears northwest of Chicago. Dr. Rebecca Hunter, an architectural historian, says Sears' mail-order homes were a small but influential part of the company's business. 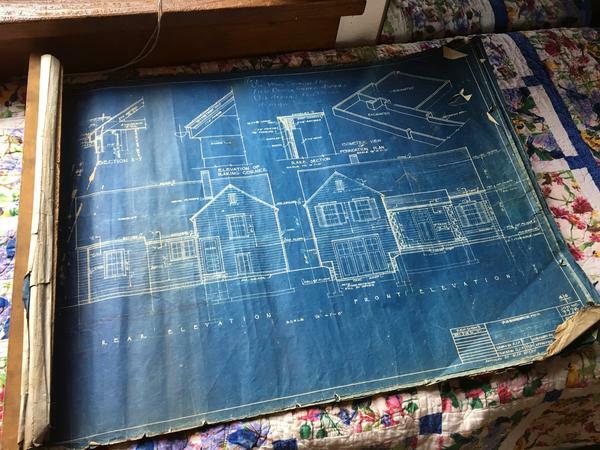 An original Sears blueprint and an instruction book told buyers how to put together their pre-cut, mail-order home step by step. 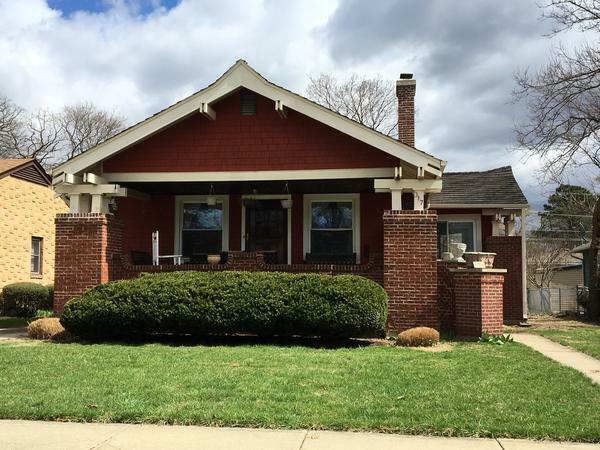 Sears called this Arts and Crafts-style bungalow "The Osborne." Buyers of kit homes could choose brick, stucco, cedar shingle or clapboard for the exterior but would have to buy brick locally. A century ago, it was one of the biggest names in retail. Now, even Sears officials say its future could be in doubt — though they say they have plans to make sure the retail icon survives. Nancy Koehn with the Harvard Business School says that in its early days, Sears Roebuck and Co. was like Amazon is today — a retailer of great disruption. For Sears, it meant a path-breaking strategy of offering all sorts of merchandise in catalogs and building department stores in remote places with ample parking. "It wasn't the Internet, but it was the same idea that no matter where you are you can touch and feel and imagine what these different products could mean in your life by virtue of an outreach, a distribution channel that an imaginative and gutsy retailer — in this case Sears — had created and then invested in and then enlarged," Koehn says. Elgin, Ill., about 40 miles northwest of Chicago, is one town where Sears' innovation is clearly visible. Drive through the streets of one neighborhood and more than likely there will be a Sears Roebuck mail-order kit house on one of the lots. 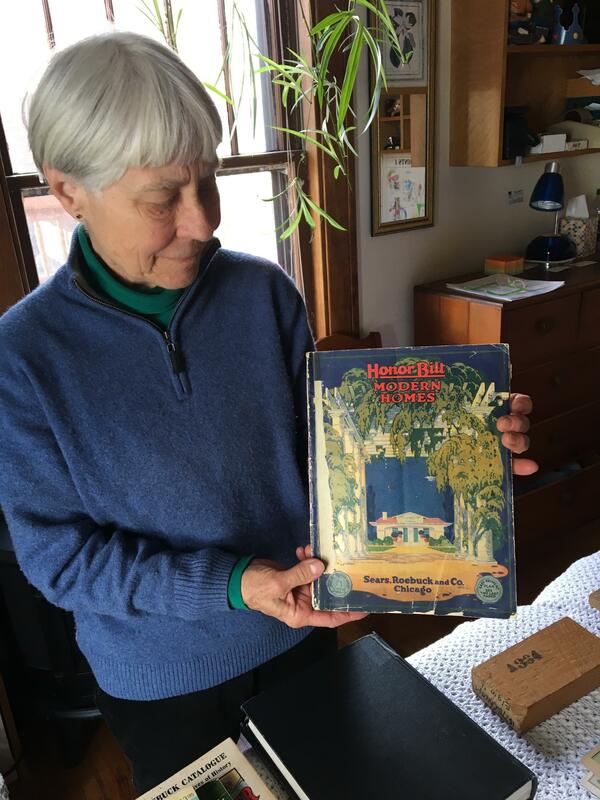 Dr. Rebecca Hunter, an architectural historian, stands on the porch of one of them — an Arts and Crafts-style bungalow listed as "The Osborne" in the Sears catalog. It's one of about 200 Sears homes in Elgin. "It's a phenomenon that gained popularity in the 1920s," Hunter says. "Mostly your framing boards were cut at the mill and numbered so that your builder would know how to put them together." Between 1908 and 1940, Sears sold blueprints and approximately 70,000 pre-cut kit houses. It was a small part of the company's booming business. Sears' stature is far smaller these days amid a constantly changing retail landscape that brought with it the dominance of Amazon, the rise of e-commerce and big-box discount retailers. It has left brick-and-mortar stores reeling. Despite its merger with Kmart in 2005, Sears has consistently lost millions of dollars each quarter. The retailer has closed hundreds of stores, slashed jobs and sold off key assets like the Lands' End clothing line and its legendary Craftsman brand — although both brands continue to be sold at Sears. Independent retail analyst Sucharita Mulpuru says these changes haven't worked. "There are just so many onerous forces relating to competition," she says. "I think that no matter what they do, they are fighting a losing battle." In a memo, CEO Eddie Lampert says Sears is taking decisive action to return to profitability and to become a new kind of retailer. Some analysts accuse Lampert of sucking the value out of the company, selling off its most marketable assets. Then there's that line in Sears' recent annual report to federal regulators that states "substantial doubt exists related to the Company's ability to continue as a going concern." But Leena Munjal, a Sears senior vice president in charge of retail operations, says reports of the company's demise are exaggerated. "Do we have challenges? Absolutely," she says. "Just like many of the retailers out there and we are all trying to figure out what are the changes we need to make to our business models to be able to rise to those challenges." Sears' transformation plan includes a membership program called Shop Your Way. Customers collect points they can redeem when they shop at Sears. The company has also worked on ways to make it more convenient for customers to shop online, or on their phones. The Sears at Woodfield Mall, about 30 miles northwest of Chicago, is huge. There are clothes, fitness equipment and aisles of gleaming appliances. Carla and Jeremy Lang push their twin 18-month-old sons in a stroller while looking at ovens and stoves. Carla Lang says they've heard about the store's financial troubles. "We've read stuff online that they may be closing stores and whatnot, but we still come here," she says. "It's close by, and like I said we've had success with purchasing things." There are others though, loyal past shoppers, who haven't been in a Sears for years. Susan Mullen has fond memories of the store but says she's not sure Sears' efforts to transform itself will work. "It fits no niche. It's not a discount place. It's not high end," Mullen says. "It has no identity anymore. I guess it tried to be everything to everybody and it was very successful at that. But now it's nothing to nobody, which is sad." But Munjal says that as a company with more than $20 billion in sales, Sears is still important to many and she invites former customers to give the company another chance while it implements changes. It's all part of the effort to counter the predictions of a slow death for Sears, while bolstering the reputation of a company that has been in business for more than a century. One of the biggest names in retail a century ago was Sears, Roebuck & Company. Sears was the amazon.com of its time, a booming innovator that spread merchandise and dreams across the country by mail order and department stores. Now, even Sears officials say its future could be in doubt, though they say they have plans to make sure the retail icon survives as NPR's Cheryl Corley reports. CHERYL CORLEY, BYLINE: Say the name Sears these days and retail giant may not be the first thing that comes to mind. Despite its deep financial troubles though, Sears is still a top retailer. Nancy Koehn with the Harvard Business School says in its early days, Sears was like Amazon today, a retailer of great disruption. For Sears, it meant a pathbreaking strategy of offering all sorts of merchandise and catalogs and building department stores in remote places with ample parking. NANCY KOEHN: It wasn't the Internet but it was the same idea that no matter where you are, you can touch and feel and imagine what these different products could mean in your life by virtue of an outreach - a distribution channel that an imaginative and gutsy retailer, in this case Sears, had created and then invested in and then enlarged. REBECCA HUNTER: This is a Sears Roebuck mail order kit home. CORLEY: Dr. Rebecca Hunter, an architectural historian, says this arts-and-crafts-style bungalow was called The Osborne in the Sears catalog. It's one of about 200 Sears homes in Elgin. HUNTER: Framing boards were cut at the mill and numbered so that your builder would know how to put them together. CORLEY: Sears sold 60,000 to 70,000 pre-cut kit houses. Fast forward to today as the winds of change blow through the retail industry, bringing the dominance of Amazon, the rise of e-commerce and big box discount retailers. It's left brick-and-mortar stores reeling. Despite its merger with Kmart in 2005, Sears has consistently lost millions of dollars over each quarter. It's closed hundreds of stores, slashed jobs and sold off key assets like the Land's End clothing line and its legendary Craftsman brand, although both will continue to be sold at Sears. Independent retail analyst Sucharita Mulpuru says it hasn't worked. SUCHARITA MULPURU: There are just so many onerous forces relating to competition. I think that no matter what they do, they're fighting a losing battle. CORLEY: In a memo, Sears CEO Eddie Lampert says Sears is taking decisive action to return to profitability and to become a new kind of retailer. Some analysts accuse Lampard of sucking the value out of the company, selling off its most marketable assets. Then there's that line in Sears recent annual report to federal regulators which states there's, quote, "substantial doubt related to the company's ability to continue as a going concern." Leena Munjal, a Sears senior vice president in charge of retail operations, says that reports of the company's demise are exaggerated. LEENA MUNJAL: Do we have challenges? Absolutely, just like many other retailers out there. And we're all trying to figure out what are the changes we need to make to our business models to be able to rise to those challenges. CORLEY: Sears' transformation plan includes a membership program called Shop Your Way. Customers collect points they can redeem when they shop at Sears. The company's also worked on ways to make it more convenient for customers to shop online or on their phones. CORLEY: The Sears at Woodfield Mall, about 30 miles northwest of Chicago, is huge. There's clothes, fitness equipment, aisles of gleaming appliances. Carla and Jeremy Lang, pushing their twin 18-month-old sons in a stroller, were looking at ovens and stoves. Carla says they've heard about the store's financial troubles. CARLA LANG: Like, we've read stuff online that they're, you know, maybe closing stores and whatnot. And - but, I mean, we still come here. It's close by. CORLEY: There are others though, loyal past shoppers who haven't been in a Sears for years. Susan Mullen has fond memories of the store but says she's not sure Sears' efforts to transform itself will work. SUSAN MULLEN: It fits no niche. You know, it's not a discount place. It's not high-end. It's just - it has no identity anymore. CORLEY: Sears Vice President Leena Munjal says as a $20-billion-plus company, Sears is still important to many. And she invites former customers to give the company another chance while it implements changes. It's all part of the effort to counter the predictions of a slow death for Sears while bolstering the reputation of a company that's been in business for more than a century. Cheryl Corley, NPR News, Chicago. (SOUNDBITE OF ODDISEE SONG, "THE CARTER BARRON") Transcript provided by NPR, Copyright NPR.